I’m not sure most people realize how much work goes into a food blog. It is definitely a labor of love, which requires a lot of time, effort, patience and creativity. I am also not sure most people, especially novelists, literary blessed beings, and bloggers with eloquent writing skills, realize how difficult it is to write for a blog. This aspect is by far, and without a doubt, my least favorite part of operating a food blog. Writing leaves you vulnerable and open to public scrutiny. It is also very tough for me to find anything to say, especially content that is engaging. I feel unbelievably boring! When a friend and fellow blogger, Karrie at Tasty Ever After, mentioned she had the same problem with writing, it gave me comfort. Not that I want her, or anyone else, to feel boring! It was just nice to hear I wasn’t alone in my frustration. Do any of you beloved readers, friends, and strangers off the street web (hopefully soon to be friends) have any words of wisdom on how to find passion and inspiration for the pen and paper? Instead of the sheer agony and despair I so often experience. Or maybe you have some advice on how to fake it till you make it to an interesting, blog worthy life? When I have writers block, and want to slam my forehead into a wall, I always turn to food for distraction. Most of the time I simply stare into my fridge or pantry searching for inspiration for the next dish. However, the most recent writers block led me to devouring a large piece of this Mocha Espresso Coffee Cake with Pecan Streusel and Glaze. And, I kid you not when I say, I totally forgot my writing woes and instead found bliss*. 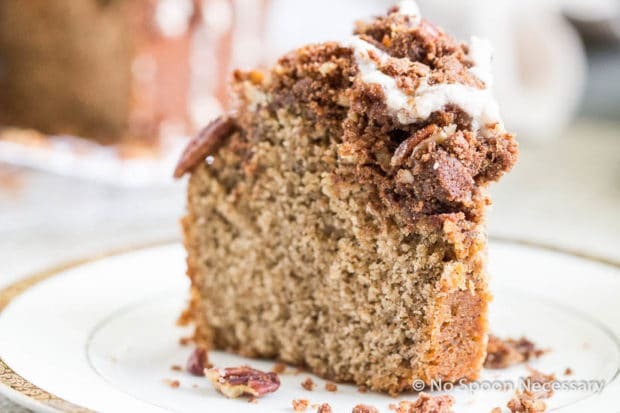 This coffee cake is definitely delicious, but aren’t most?? 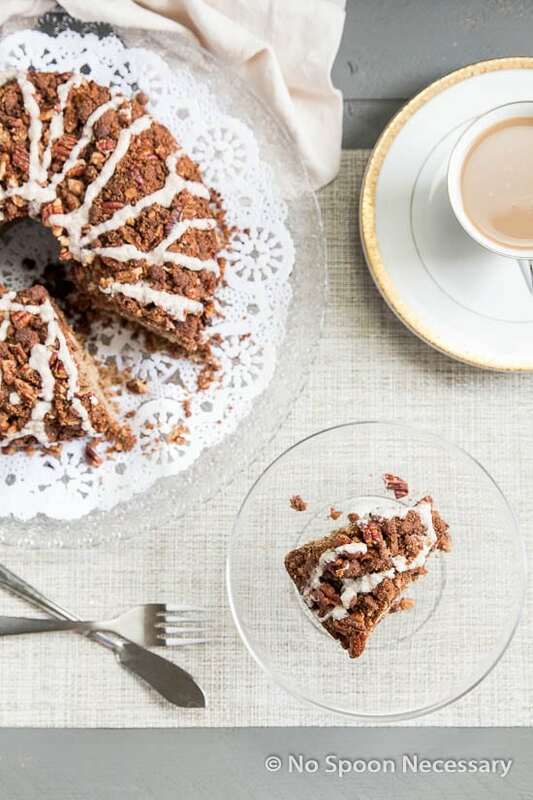 One thing that sets this cake apart is that it is indeed a “coffee” cake. Well, technically an espresso cake, but same-same. The addition of dry espresso granules provide depth of flavor and add warmth to the overall taste of the cake itself. The texture of the cake is dense, but light and airy. Flavor wise, it is slightly chocolaty, a tad sweet and a little savory… yielding a coffee cake with layers of delicious, soft flavors. And, that is just the cake! Of course I had to add even more layers, for an even more awesomely addictive coffee cake. I love streusel, if I could find a way to add it to the top of every meal I would. 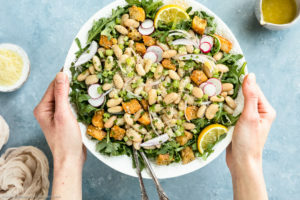 But, streusel topped chicken? Yeah, not so much. 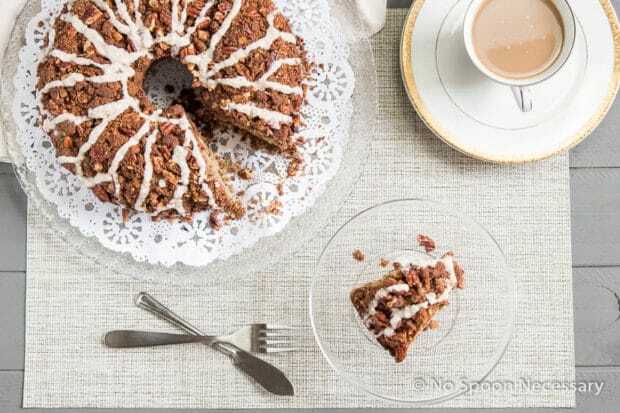 The streusel topping on this coffee cake is crunchy from the pecans with sweet bursts of deliciously dense mocha crumbs. 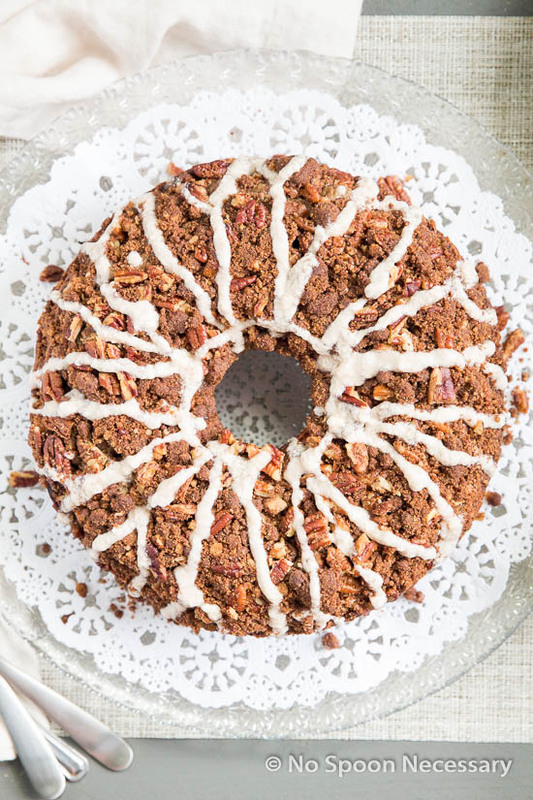 While the streusel and the cake are fantastic on their own, they become magical when drizzled with the sticky, sweet glaze. 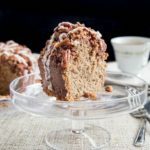 You should definitely make this coffee cake to have on hand next time you are experiencing frustration. Or just to have with your cup of morning Joe. Or just because it’s seriously too good to not have in your house. 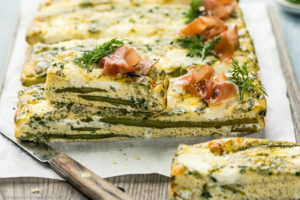 So, you should just make this, mmmkay? Trust me, you will thank me. 🙂 Cheers to cake that’s perfectly acceptable to eat for breakfast! 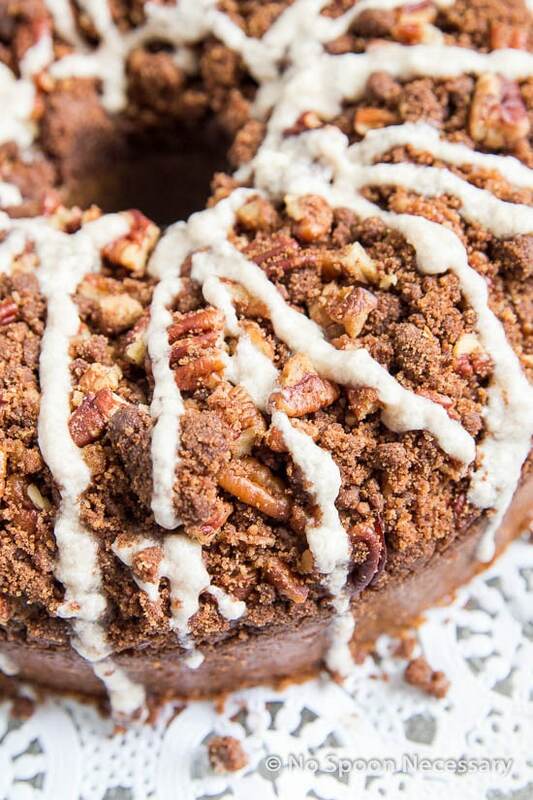 Mocha Espresso Coffee Cake with Pecan Streusel & Glaze. 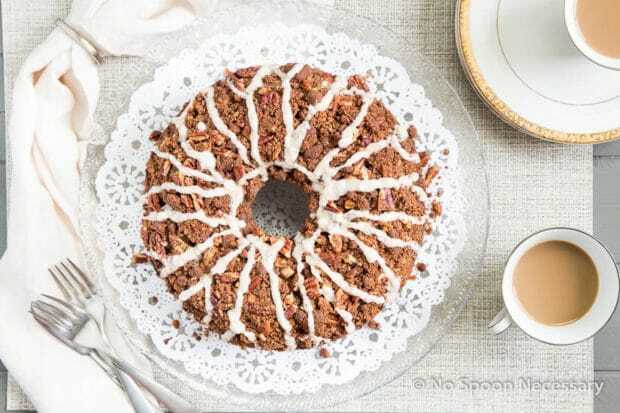 Loaded with chocolate, espresso and generously glazed, this coffee cake is heavenly delicious! 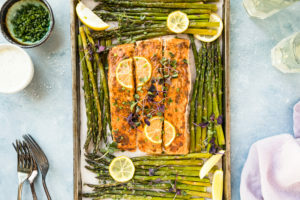 Preheat oven to 350 degrees F. Spray a 9’’ tube pan with removable bottom with non-stick cooking spray. For the Cake: In a large mixing bowl combine the sugar, vegetable oil and eggs. Whisk until light in color and well incorporated, about 2 minutes. Add the chocolate milk and espresso powder. Mix until combined. Set aside. In a separate small bowl: Whisk together the flour, baking powder and salt. Add to the sugar/chocolate milk mixture. Stir until JUST combined. 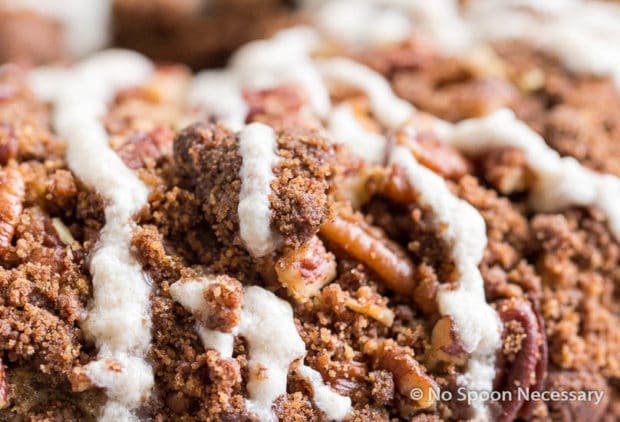 Prepare the Streusel: In a large mixing bowl combine the ingredients aside from the butter and pecans. Stir until well incorporated. 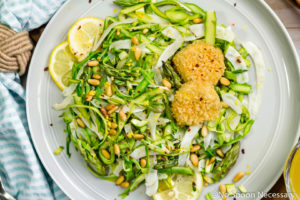 Drizzle in the melted butter and mix with a fork until combined. Stir in the pecans. Set aside. Prepare the Glaze: In a medium sized mixing bowl whisk together the powdered sugar and chocolate milk until smooth and no lumps remain. For a thinner glaze, add more chocolate milk, 1 teaspoon at a time, until desired consistency is achieved. Set aside. To Bake: Pour the cake ingredients into the prepared bunt pan. Top evenly with the streusel topping. Bake for 45-55 minutes, or until a toothpick inserted into the center comes out clean. Allow to cool for 10 minutes in pan before removing bottom of pan and transferring cake on to a clean platter. Drizzle with glaze and serve. 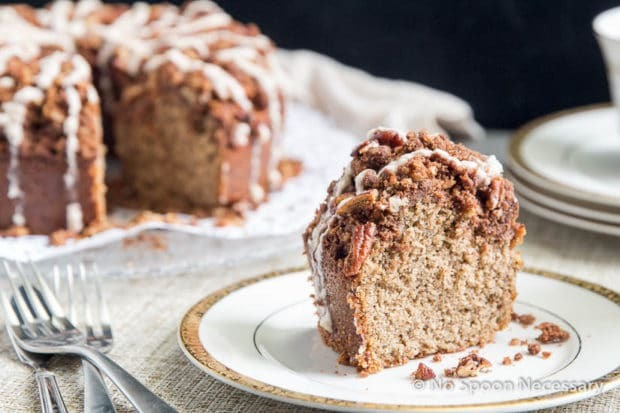 *Coffee cake will keep stored in an airtight container for up to 4 days, however coffee cake tastes best the first 2 days. 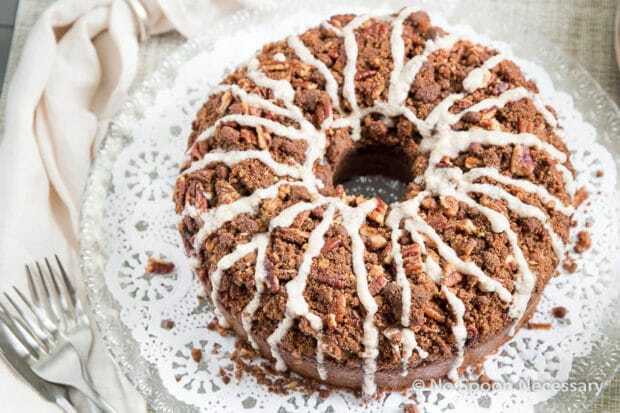 If one were to substitute the bundt pan for a different cake pan would it still turn out well ? Honestly I’ve only ever made this in a bundy pan, so I can’t really say. I’m assuming it would be fine. I would watch your bake time, it might take longer. Just be sure to bake it until a toothpick inserted into the center comes out clean. Thanks for stopping by! If you try it, I’d love to hear how it turns out! Cheers! 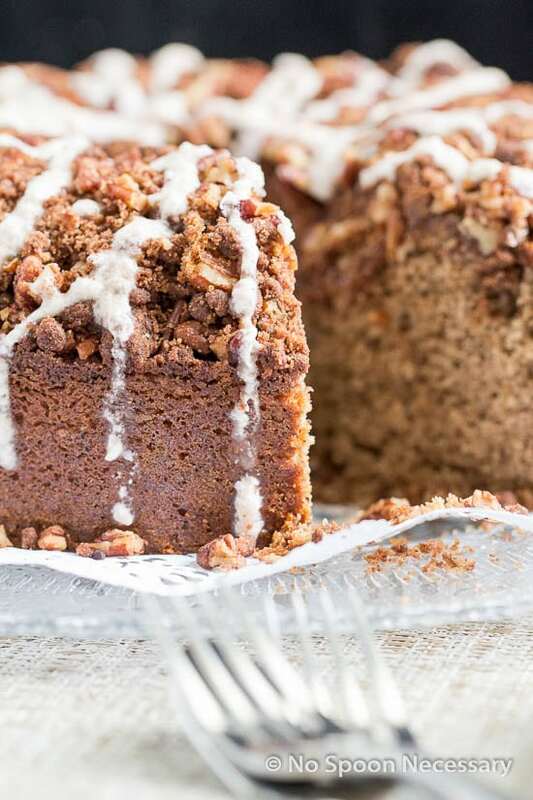 This coffee cake looks absolutely amazing! Thanks for sharing your feelings about writing. I can definitely relate. I always struggle with how much I want to share , what my “voice” should be, how much I should write, etc etc etc. This post was a great reminder that we all struggle sometimes and that I should just relax and keep it simple. Thanks Cheyanne!! 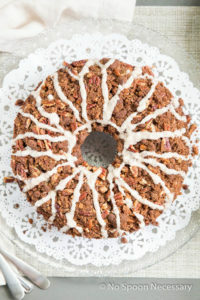 I love bundt cake and this looks truly amazing. Pinning! 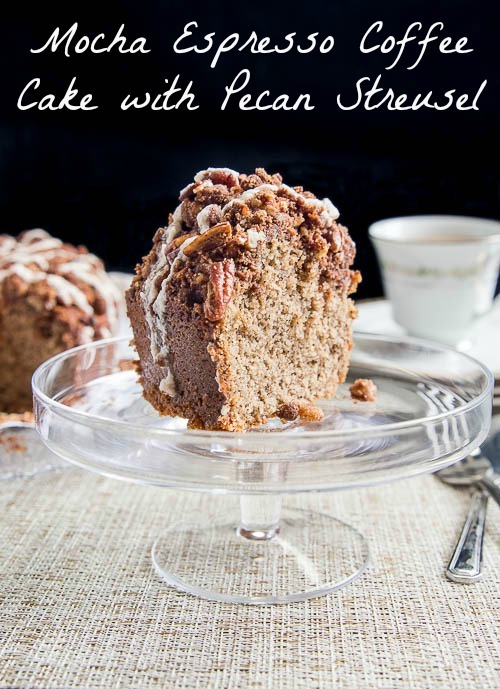 The coffee-cake looks scrumptious. And I can totally relate to everything you’re saying. But I keep saying to myself, “If you build it they’ll come.” So eventually us newbies will find readers, that like reading about our nothings. M., Thanks for stopping by and leaving such a sweet comment. Love the “if you build it, they will come” attitude! Totally on board with that train of thought. 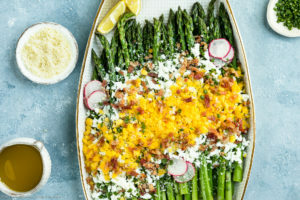 But, even if no one ever reads a word of my ramblings, I’m having fun with the food blog. At the end of the day, that is all that really matters 😉 (but a little following never hurt anyone! lol) Cheers! Hi Cheyanne, your beautiful mocha espresso coffee cake brought me to your site today. When I read your post, I could identify with it so much. I’m new in the blogging world and some days the words just won’t come. 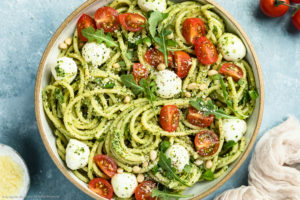 That is until one day when I was talking to my daughter, both of us utilize food bloggers to find inspiration for our cooking lives, and she made the offhand remark that she never reads what a blogger writes only just the recipe.